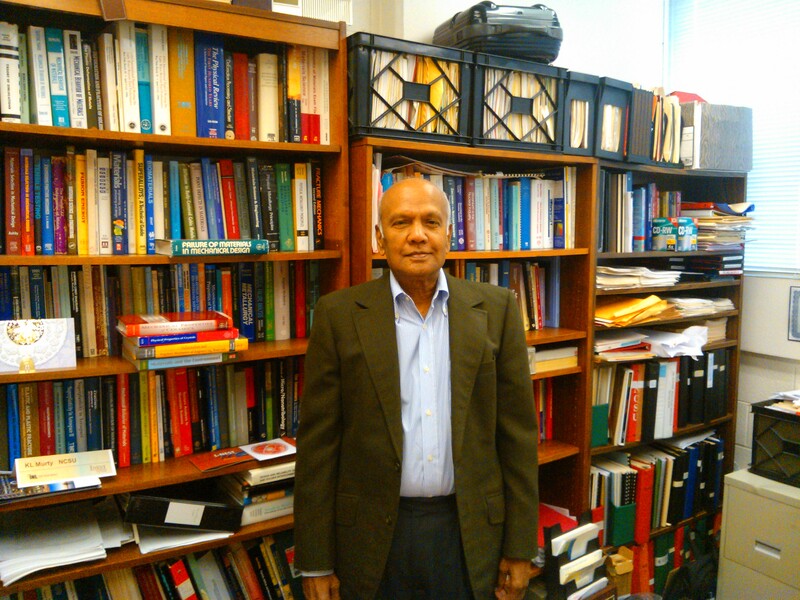 Dr. K. Linga Murty is a Professor at North Carolina State University in Nuclear Engineering and Materials Engineering. I received a Bachelors and Masters degree in Physics from Andhra University, India, in 1962 and 1963 respectively. I also received a M.S. and a PhD in Materials Science from Cornell University in 1967 and 1970 respectively.Dr. K. Linga Murty has received the Alcoa Foundation Research Achievement Award and the ANS Mishima Award, am a fellow of AMS-International, IIM, and The American Nuclear Society, and have published around 210 technical papers. Dr. K. Linga Murty's experience and interests comprise of failure analysis, corrosion and SCC, structure-property relation, effect of aggressive environment and neutron exposure on the mechanical properties and fracture characteristics, formability of metals, superplasticity, development of crystallographic texture and the resulting anisotropy, etc. The materials studied include aluminum alloys (Al-Mg, Al-Zn), pressure vessel steels, zirconium alloys (Zircaloy), stainless steels, turbine materials (Ni base superalloys), lead alloys (Pb-Sn), copper-gold alloys, alkali halides, high purity iron and molybdenum, hcp metals (Zr, Ti, Mg, Zn and their alloys), ferritic steels, WC-Co tool materials, nano-grained iron and single crystalline alkali halides; NDE and NDT for life assessment of structural materials using ball indentation, and non-invasive in-situ NMR investigation of the dynamical behavior of point and line defects in alkali halide single crystals (pure and doped NaCl, NaF) and thin foils of Al. In collaboration with the MCNC Center for microelectronics, I investigated the reliability of solders in electronic packaging with emphasis on flip-chip (C-4) technology for multichip modules. Recent funded research (since 2002) emphasizes anisotropic biaxial creep of textured Ti-alloys, and SPD- processed nanograin structured single and multiphase metallic systems.